Heaven knows how I will cope without the security of knowing I can call you for a couple sessions when things were getting rough! I feel so much better prepared to manage this complex environment with the leadership skills you helped me develop. My enduring thanks! 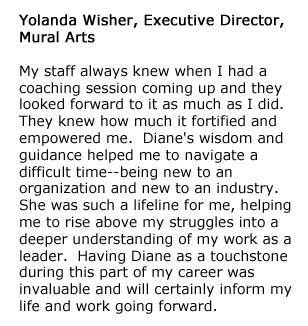 Thank you so much Diane! Your teachings have been a great help and made a significant impact on my work and life. 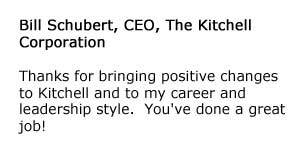 Thanks for bringing positive changes to Kitchell and to my career and leadership style. You’ve done a great job! 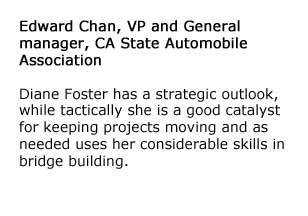 Diane Foster has a strategic outlook, while tactically she is a good catalyst for keeping projects moving and as needed uses her considerable skills in bridge building. 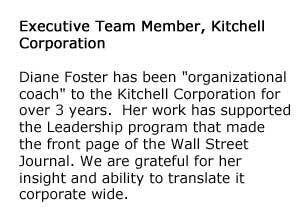 Diane Foster has been “organizational coach” to the Kitchell Corporation for over 3 years. Her work has supported the Leadership program that made the front page of the Wall Street Journal. 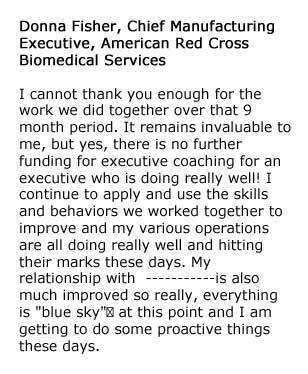 We are grateful for her insight and ability to translate it corporate wide. 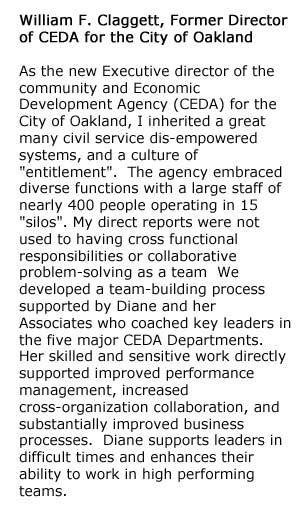 to discuss how DFA can your current needs, and learn how Executive Coaching can help support your organization. Contact Diane Foster to discuss your needs and begin customizing a package. Leaders eliminate problems and achieve focused goals, seizing opportunities with “real-time” strategies-and new competencies that yield measurable outcomes with minimal time invested. An Executive Coach can help you transition from functional success in a lackluster position to true leadership with promise of growth. Partner with a seasoned coach to identify your goals and develop a personalized plan customized to achieve your desired growth through new, outside-the-box solution-finding challenges. Each Client is unique. 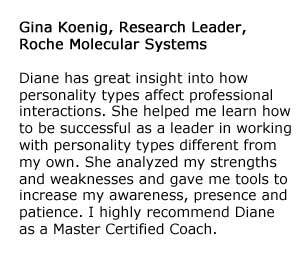 Diane will work with you to develop a customized package to fit your needs and optimize your results.